EXCLUSIVE / Israel has seized three EU-funded humanitarian aid projects on the edge of a settlement construction zone that Europe views as a ‘red line’, spurring demands for compensation payments to Brussels at a crisis moment for John Kerry’s Mideast peace bid. 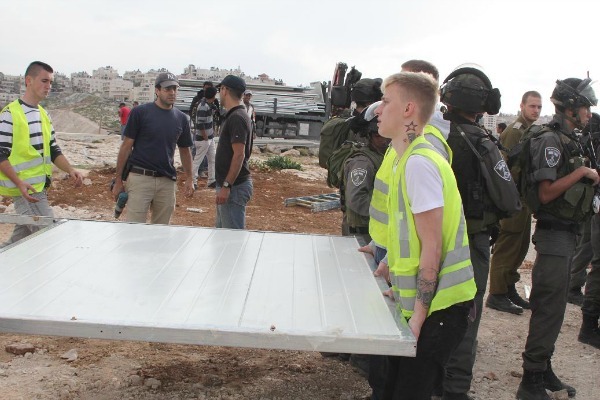 The three humanitarian aid shelters were dismantled on 8 April in Ras-a-Baba, also known as Jabal-al-Baba, which lies in the E1 corridor of the West Bank, linking the settlement of Ma’ale Adumim to Jerusalem. All three shelters were prefabricated caravans, built for families made homeless in severe storms that hit the region in December. They were funded by the EU’s humanitarian aid wing, DG ECHO, and some were provided by the French development agency, Action Contre la Faim (ACF). Saeb Erekat, the chief Palestinian negotiator, told EURACTIV that the seizure was “more than a provocation, it is a crime,” and linked it to the deteriorating Mideast peace process. EU officials contacted by EURACTIV confirmed that they also saw the Israeli action as a “forced displacement of Palestinians” that breached international law and “must be halted immediately”. “While we acknowledge that these events come at a politically sensitive time where parties to the conflict are currently negotiating a peace-deal brokered by the US (Secretary of State) John Kerry, we must nevertheless denounce the humanitarian consequences of such actions and try to prevent further demolitions from occurring by unreservedly condemning them,” a senior source said. Internal discussions are underway over proposals to demand compensation for such actions in future. The dismantling of Palestinian homes in the E1 region has previously been followed by settlement construction. In November 2012, the Netanyahu government announced a zoning plan to build 3,000 Jewish housing units in E1 that would create an urban bloc linking Jerusalem and Ma’ale Adumim, and disrupting the territorial coherence of any future state. The Conclusions pledged to “closely monitor the situation and its broader implications, and act accordingly.” EURACTIV understands that a delegation of European diplomats in Jerusalem will deliver a complaint to the Israeli authorities about the seizure today (11 April). More actions could follow. Some 79 EU-funded structures were demolished in the West Bank’s ‘Area C’ and Jerusalem region in 2012 and 54 more were destroyed in the first six months of 2013, according to an EU incident logging service. In all, the European Commission says that between 2001 and 2011, Israel destroyed development projects worth €49.14 million, of which €29.37 million was funded by the EU or its member states. As Israel is increasingly blamed for an impasse in Mideast peace talks, calls are growing for compensation for such actions at an EU Mashreq and Maghreb (MaMa) working group meeting that is expected to deliver recommendations on an EU ‘Area C’ report on Tuesday 15 April. The EU’s humanitarian aid commissioner, Kristalina Georgieva, recently wrote a letter to the Israeli defence minister Moshe Ya’alon, outlining her concerns about the destruction of EU-funded structures in the West bank. But it remains to be seen whether a proposal to demand recompense will be included in the final note, which will then face a long route to the European Council. Maja Kocijancic, a spokesperson for the EU’s foreign policy chief, Catherine Ashton, would only say that a delegation of diplomats visited the caravan site, also known as Jaba-al-Baba in February, when ‘stop work’ orders were first delivered and would do so again today. “We will raise this issue with the relevant Israeli authorities,” Kocijancic said. An Israeli spokesman contacted by EURACTIV declined an interview about the new E1 action but sent a statement saying that the three caravans were seized because they had been “assembled illegally”. “At least two of the buildings [were] located on state land and within the jurisdiction of the city of Ma’ale Adumim,” the statement read. EU officials counter that the lack of any meaningful permitting regime for Palestinians can make complaints of permit violations a self-reinforcing proposition, and some fear that they can make EU aid funding complicit in violations of international humanitarian law. The Ras-a-baba demolition occurred hours after an instruction by Israel’s Prime Minister Benjamin Netanyahu, to his ministers to stop all high-level meetings with their Palestinian counterparts, in retaliation for a Palestinian bid to join 15 UN treaties and conventions as a state party. This has been seen as the end of US Secretary of State John Kerry’s attempts to revive the battered 1993 Oslo peace Accord in the form of a framework agreement on principles. While the Oslo talks have ground on, by 2011, Israeli settlements which are considered illegal under international law, had expanded to house over 520,000 settlers, according to the UN Office for the Coordination of Humanitarian Affairs (OCHA). The following year saw a 300% increase in the number of settler units issued for tender, OCHA says. In total 43% of the West Bank has now been allocated to settlement local and regional councils. Israel occupied the West Bank and east Jerusalem following the Six Day War in June 1967, and almost immediately began building settlements for Israeli Jews to live on. The settlements are thus considered illegal by the International Court of Justice and the international community. During the Oslo process, the settler population more than tripled and today, it is thought to be roughly 500,000, with around 300,000 settlers living in 121 settlements and about 100 outposts in the West Bank, and 200,000 living in east Jerusalem, according to the Israeli human rights group B'tselem. Israeli organisations & companies love taking part in Framework Programme projects – it gives them some sort of legitimacy – ban them as until such time that the Israeli state gets serious with the Palestinians – ditto for Horizon 2020. They need us much more than we need them. Easier solution: Try to coordinate humanitarian aid with the Israeli authorities and don’t politicize it.